Valentine’s Day is a wonderful opportunity to share love and warmth with the special people in your life, especially your elderly relative. Harrisburg in-home care experts, Home Care Assistance, offer these five great ideas for spending the day with your senior loved one. There are many paint your own pottery shops and seasonal events are popular. Check local listings for a pottery-painting store near you. If they don’t have a scheduled February event, perhaps you could organize your own party at their venue. 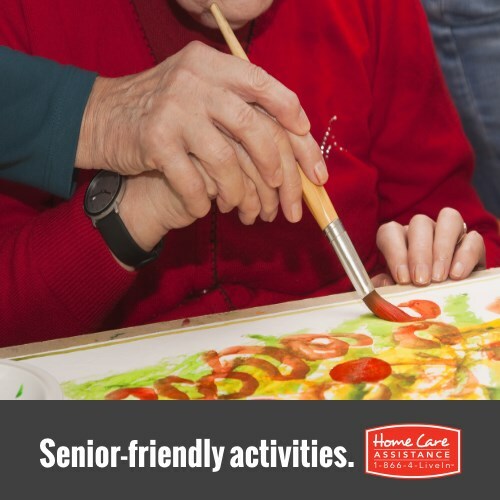 The best thing about this activity is creating not just a loving memory, but also a beautiful piece of painted pottery your senior loved one can use all year long! Common painting fees are around $10 plus the cost of the pottery piece. Hershey, PA features a month long “Chocolate-Covered February.” Choose from events such as chocolate dinners, wine and chocolate pairings, create your own chocolate truffle classes, and sampling desserts at Hershey’s Chocolate World attraction. Events range in price, starting at $10 per person. If you can’t make the trip, create your own chocolate themed event. Set up a chocolate fondue station, put out an array of chocolate treats, or create your own wine and chocolate pairings. There was a special childhood delight about hand making cards for loved ones. Recapture that feeling with your senior loved one by making cards for friends and family members. Gather construction paper, doilies, glitter, or any other craft items that will look great on a Valentine’s card and craft away. February is Library Lovers Month. Check your local library for event listings, or simply choose to do something nice for your library or those who work there. Donate some books that you no longer need for an upcoming book sale, or write a letter of appreciation to a library volunteer. This is a free way to spread some love and enjoy your local library haven! Many teahouses host high teas in the afternoon. Cost varies, but plan to spend around $25 per person. Be sure to make advanced reservations for you and your senior loved one, and invite other family to tag along. Encourage your senior loved one to wear something with Valentine’s colors and get ready to enjoy scones, fruit, sandwiches, tea, and other delectable items. It’s important to show love to the people who matter most year round, but Valentine’s is a great day to take it up a notch. Make your senior loved one feel safe, secure, and involved all year long with an hourly or live-in caregiver in Harrisburg. Our caregivers can provide transportation, help with grocery shopping, meal prep, and light housework, and offer companionship. We are available 24/7, never require long-term contracts, and every caregiver is expertly trained. Learn more about services near you by calling (717) 540-4663 and speaking with a friendly Care Manager today.